Poor dental health in children affects both their general health and their self-esteem. Unfortunately, the consequences of untreated tooth decay and gum disease last well into adulthood. As adults, these kids are more prone to chronic diseases like heart disease, stroke, or pulmonary disease. Yet, 42% of children between the ages of two and eleven have cavities in their primary teeth. Even more shocking is the figure showing about 20% of children between five and eleven years old have at least one untreated decayed tooth. Luckily, tooth decay and gum disease are entirely preventable. By following a few simple guidelines, parents can keep their children’s smiles beautiful and their teeth strong. 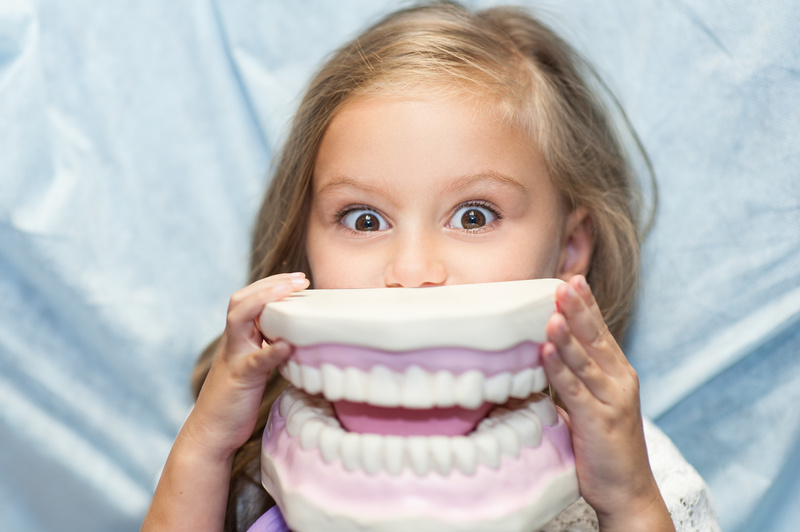 Below we’ve got the five best tips to ensure strong teeth in your kids. Read on for the complete guide to good dental health! It’s never too early to begin a regular brushing routine. With small infants, use a small wet washcloth or gauze to wipe off their gums. When the first tooth appears, begin using a soft-bristled child’s toothbrush. Let your child begin brushing their own teeth between the ages of three and five. Of course, you’ll need to supervise them. Make sure they brush each tooth in a little circle instead of roughly scrubbing their teeth. Also, have them brush for at least two minutes. This may be hard when they have only a couple teeth, but it’s a good habit to start as early as possible. Use a timer or play their favorite song to help them. Kids also like to pick out their own toothbrush and toothpaste. Let them do it (as long as it is a fluoride toothpaste). Their favorite character will motivate them to practice brush more often! As adults, we may be guilty of not flossing regularly, but it’s one of the best ways to keep our teeth healthy and strong. Brushing alone cannot remove all the bits of food that get stuck between your teeth. Children can begin flossing when their teeth touch each other. You can buy disposable child-sized flossers just about anywhere. Kids like their bright colors and will enjoy imitating you if you floss your teeth as well. Seeing a pediatric dentist regularly helps keep your kid’s teeth strong. Their first visit should occur around their first birthday. A pediatric dentist will be able to spot potential problems early. And your child becomes comfortable with them. What’s more, studies have shown parents save money by scheduling their child’s first dental visit early. Even waiting until your child is two or three can mean more emergency and restorative treatments. After their first visit, children should see their pediatric dentist every six months (just like adults). The dentist observes any tooth decay and gives you helpful information on maintaining your kid’s dental health. Parents know a healthy diet is good for their kids. The same goes for their teeth. Foods rich in calcium are vital for strong teeth. Calcium strengthens tooth enamel as well as the bones around your child’s mouth. It also neutralizes acids that promote tooth decay. Foods like milk, cheese, and yogurt are all good sources of calcium. Also, crunchy foods like apples and carrots are nature’s toothbrushes. They remove plaque naturally as your child chews and should often be consumed. Finally, foods high in protein and vitamin C are also essential for dental health, as are nuts and seeds (think sunflower seeds). Make sure your child has a diet rich in fruits and vegetables for the best dental health. Sugar is a major food source for bacteria on your teeth. It causes plaque and leads to cavities. For these reasons, you need to limit it in your child’s diet. This is especially true for sugary drinks. Soda, fruit juice, and sports drinks all contain enormous amounts of sugar and should be avoided. Water is always the best option for strong teeth. Those are the five top tips for making sure your children have strong teeth. Brushing and flossing, seeing their dentist, and eating a healthy diet are the best ways to promote good dental health. This is true now and during their entire lifetimes. Are you looking for a reputable dentist in Chattanooga, TN? We have decades of experience and can provide a safe, comfortable atmosphere for your child. Why not contact us today? We’d love to hear from you!